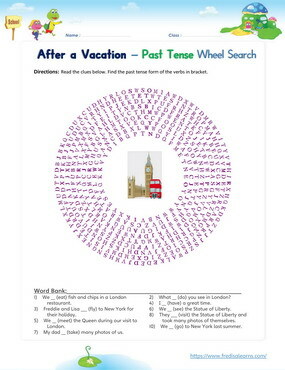 The lesson places particular emphasis on the simple past tense form of irregular verbs. The worksheets below are useful for offline and classroom activities. 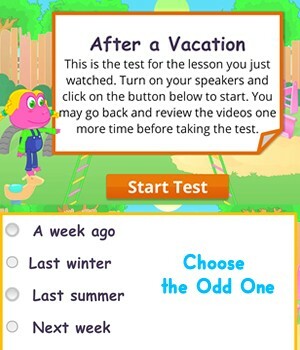 These printable exercises directly correlate with the above lesson 'After a Vacation'. Every worksheet comes with an answer sheet on the second page for educators. Students have just returned from their summer vacation. Ms. Ann asks them to get into a group and talk about their vacation. Bob and Sally went to London, where they saw Big Ben. Freddie and Lisa went to New York City where they saw the Statue of Liberty and watched a musical on Broadway. After the group discussion, Ms. Ann asks for a recommendation on where to go for her next vacation. 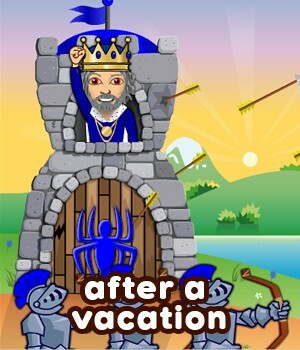 Where did you go for your vacation? What did you see in London? Did you meet the Queen in London? No, we didn't meet the Queen. Yes, we met the Queen. Yes, we had a lot of fun. How did you travel to New York City? What places did you visit in New York City? We visited the Statue of Liberty. What did you eat in New York City? We ate lots of good food.